Fully customizable, with any number of incomes. Seamlessly syncs between your iPhone and iPad. You can export all or part of your data at any time. 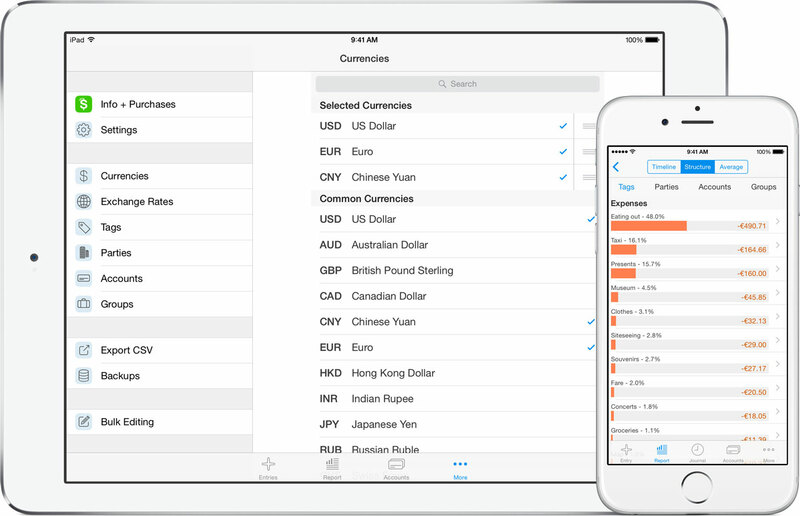 Use any number of currencies, out of over 160 world currencies. Great for travelers. Includes recurring entries, passcode protection, bulk editing, and much more. Version 2.15 fixes Face ID support under iOS 12. Version 2.14 adds support for new iPhone models. Version 2.13 is available with some minor bug fixes. Versions 2.11 and 2.12 provide compatibility improvements and bug fixes. Version 2.10 adds a new currency: Bitcoin (BTC). Version 2.9 is available with iPhone X support and some fixes.